1. Click the Next button on the Individual Report screen. 2. The Group Membership Dates display the current academic year by default. 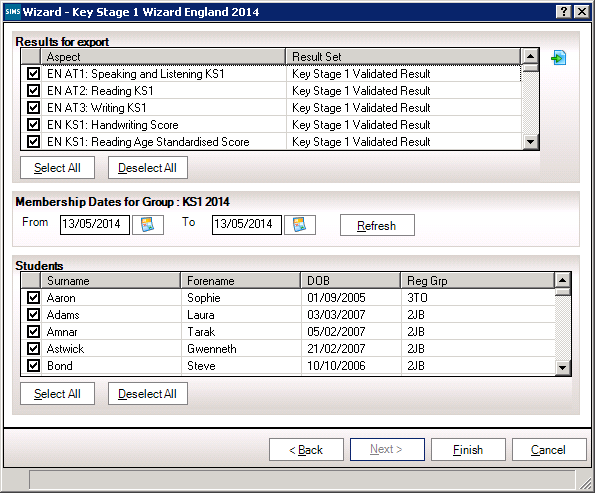 If you wish to change these dates click the Refresh button to display the pupils who are on roll between the selected dates for the particular group. 3. 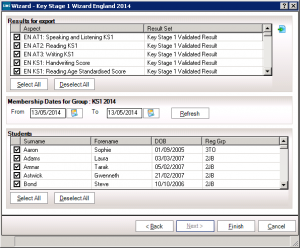 Deselect the check boxes adjacent to any pupils for whom you do not wish to export results. 4. Click the Export button, enter a name for results file and navigate to the location where you would like the file to be saved. 5. Click the Save button and a message The XML file has been created successfully will be displayed at the bottom of the Export screen. 6. Click the Finish button to exit the wizard. 7 .Upload the file to your LA in the normal way prescribed by them.